Meningoencephalocele means protrusion or herniation of brain (neural) tissue along with meninges through a defect in the cranium into a swelling filled with cerebrospinal fluid (CSF). It is very rarely associated with Arnold-Chiari type III (ACM type III). Size, location and type of content of the swelling determine the surgical as well as anaesthetic problems. The most common challenges faced by anaesthesiologist in managing these patients are related to positioning of head and prevention of rupture of swelling, airway management, fluid and blood loss and maintenance of body temperature. In order to manage huge meningoencephalocele, you need a well-planned approach amongst anaesthesiologist and surgeon. The cephalocele is a cystic variety of cranial dysraphism and refers to a defect in the skull and dura with extracranial extension of intracranial structures. It is because of failure of surface ectoderm to separate from neuroectoderm Cephaloceles are divided into four types: meningoencephalocele, meningocele, atretic encephalocele and gliocele. Meningoencephalocele is a hernial protrusion of part of meninges and neural elements in a sac through the skull defect. In Southeast Asia, the incidence is approximately 1 in 5000 live births. Encephaloceles can appear on any part of the skull and are best classified by its location. The most common site of encephalocele is occipital (75%) followed by frontoethmoidal (13–15%), parietal (10–12%) or sphenoidal. Gender difference is seen as anterior encephaloceles are more common in males while 70% of posterior or occipital encephaloceles occur in females Neurological outcome of such malformations depends on the size of the sac, neural tissue content, hydrocephalus, associated infection and other pathologies that accompany this condition. Due to presence of huge congenital swelling, increasing in size, the child came for consultation. Here we want to discuss successful anaesthesia management of giant meningoencephalocele with Arnold-Chiari type III (ACM type III) with presence of atrial septal defect (ASD). 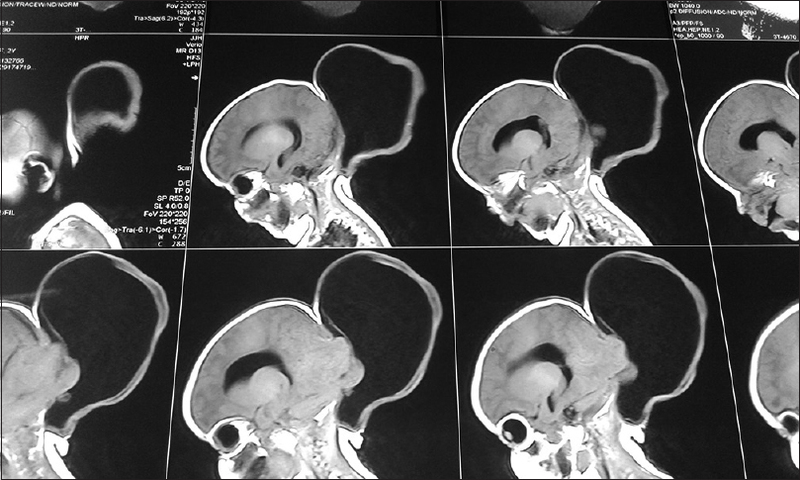 A 3-month-old child weighing 4.7 kg was referred to our hospital with complains of increasing size of swelling over the occipital region of head, present since birth. Baby weighing 3.0 kg was born in district hospital at full-term via vaginal delivery with a Apgar score of 8 at birth and 10 after 2 min. The child had delayed milestone with poor feeding and absent neck holding. Though social smile was there but child was not able to recognise mother. Obvious neurological deficit was absent and motor power in all four limbs were normal. Baby was screened for other congenital anomalies in which ECHO showed presence of a small 5 mm ASD with L→R shunt. Magnetic resonance imaging (MRI), computed tomography (CT) and ultrasound (USG) showed a 12.1 × 11.7 × 8.4 cm cerebrospinal fluid (CSF)-filled dural sac herniating through a large 4.5 cm bony defect in occipital bone containing bilateral posterior occipital lobe and a part of cerebellum. It also showed corpus callosal agenesis, tectal beaking, protusion of cerebellar tonsil through foramen magnum extending behind 19 mm of cervical spinal cord along with syringohydromyelia of entire cord, mild supratentorial hydrocephalus. The radiological finding suggested of ACM type III. Rest of the laboratory investigations were normal [Figure 1]. In operation theatre a sterile cotton platform with annular hole in centre was made to place the sac carefully [Figure 2], to avoid any pressure on it. In order to align the torso in same plane as the head, a pillow was cushioned with cotton and the baby was placed in normal supine position. 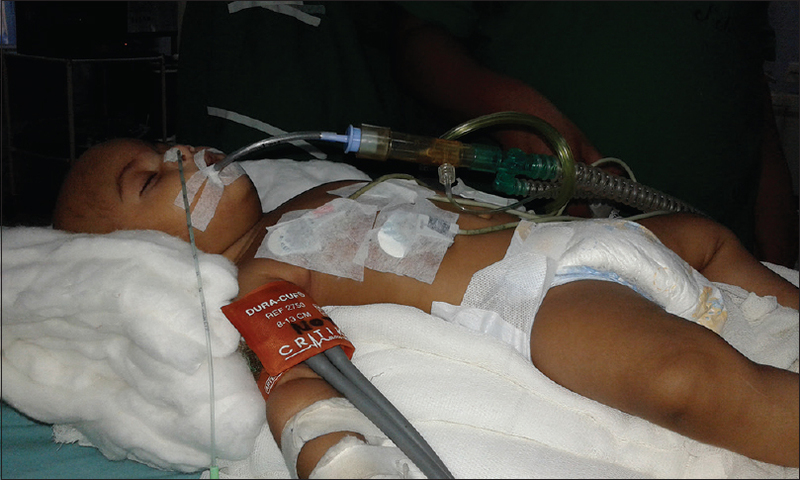 All routine monitors [ECG, NIBP, SPO2, temperature (skin) probe] were attached, child was induced with sevoflurane (3–5%) in 100% oxygen using the Jackson-Rees Circuit and an intravenous access was secured with 24G JELCO on the left hand. Inj. glycoprolate 0.03 mg and inj. fentanyl 10 μg was given. After ensuring adequate mask ventilation muscle relaxation was achieved with inj. atracurium and trachea was intubated with 3 mm uncuffed flexo-metallic endotracheal tube (ET) in a single attempt by a senior. ET tube placement was confirmed by auscultation and appearance of capnograph [Figure 3]. Oral packing was done. In lateral position, lumbar drain was put at L4–L5 space with 22G epidural set. Intraop anaesthesia was maintained with O2:N2O – 50:50 and sevoflurane at 1–2% along with bolus of inj. atracurium. Child was positioned in left lateral position for surgery and 200 cc of CSF was slowly aspirated by surgeon [Figure 4] and [Figure 5] from the swelling to prevent rupture, then by posterior paramedian incision, encephalocele sac along with a genetic brain tissue was excised and primary duraplasty was done. Blood loss was around 100 ml, which was replaced by blood and Ringer's lactate solution was used as replacement and maintenance fluid. Total surgical time was 3 h. Body temperature was maintained using fluid warmer to infuse fluid and keeping the operation theatre temperature between 22–25°C. At the end of surgery neuromuscular blockade was reversed with glyco and neostigmine and trachea extubated after baby was fully awake with all four limbs moving. Analgesia was achieved with inj. paracetamol 10–15 mg/kg body weight. The baby was weighed postoperatively, her weight was 2.8 kg, which meant that weight of an occipital encephalocele was 1.7 kg. Lumbar drain was maintained for 5 days and after ensuring no CSF leak it was removed and baby was discharged on 11th postoperative day. Meningoencephalocele is a congenital neural tube anomaly, which may be associated with other anomalies like congenital heart disease, club foot, Dandy-Walker malformation, hydrocephalus, Chiari's malformation, extrophy of bladder, syndactyl, prolapsed uterus and Klippel-Feil syndrome. The above-reported child had mild ASD of 5 mm with L→R shunt which did not have much effect on surgery as well anaesthesia management though we took all precautions to avoid venous air embolism. Securing an airway in paediatric patient is always been a challenge to anaesthesiologist, and presence of huge swelling over occiput may further aggravate the difficulty. Mostly these patients can be intubated either in the lateral position or in the supine position by supporting head in different ways. As positioning is crucial, so as to facilitate smooth intubation and prevention of rupture of sac, different methods have been adopted by anaesthesiologist to mask ventilate and intubate like placing the child in lateral position, secondly one person holding and supporting the head at the edge of table while Mowafi et al. used sterile surgical towels to make stacks to support the swelling, while traditionally head can also be placed in doughnut-shaped support. In our case we modified the traditional and Mawafi's method by placing the sac inside the support made with sterile cotton and having a hole in it and placing torso on the pillow covered with sterile gamzee so as to match the height of meningoencephalocele sac, thus making mask ventilation and intubation smooth and easy. Patient was positioned lateral for the corrective surgery and to prevent sudden loss of CSF, initial 200 ml was aspirated so as to facilitate dissection of sac by posterior paramedian incision. 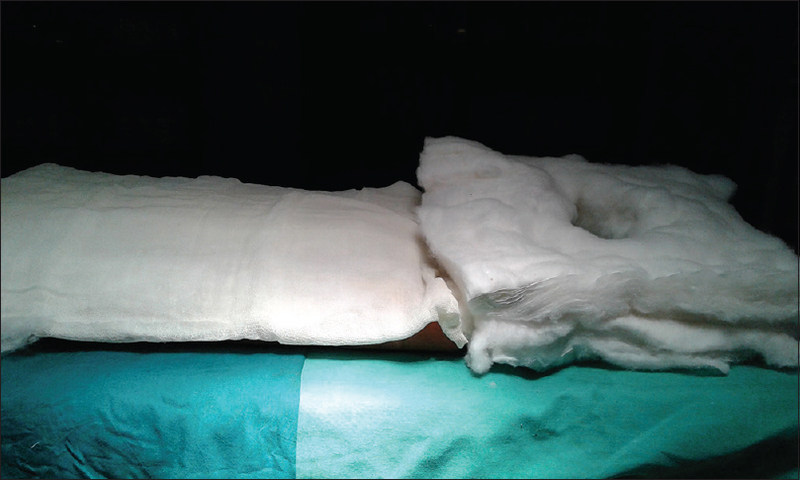 A tight primary duraplasty was done and no attempt was made to close 4.5 cm bony defect. In a study conducted by Mahapatra suggested that in neonates and infants, no attempt should be made to cover the bone defect by a bone graft. Postoperatively these may develop into hydrocephalus leading to raised intracranial pressure which will result in scar dehiscence and CSF leak. In our child, lumbar drain was put after induction so as to prevent collection of CSF and development of hydrocephalus after duraplasty. In 60–70% of patients with posterior encephaloceles, hydrocephalous develops post-operatively requiring ventriculo-peritoneal shunt. It may be noted that hydrocephalous, which was not apparent preoperatively can become apparent after the repair of an encephalocele. 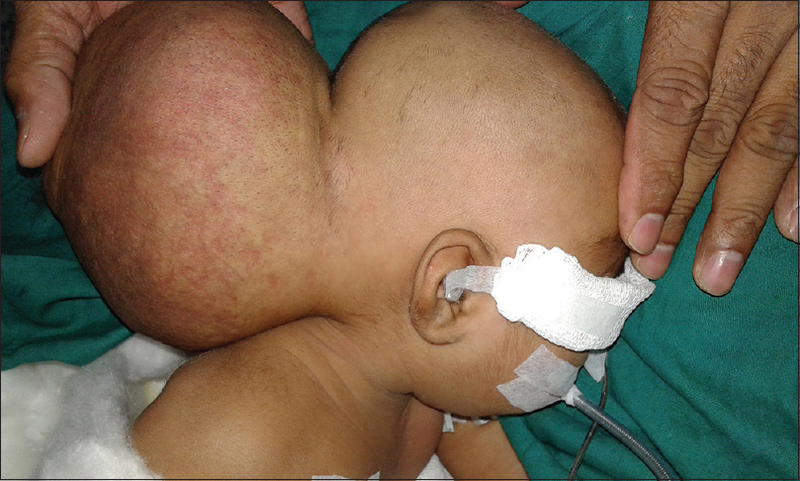 The above-reported child presented with hydrocephalous after 3 months of hospital discharge and had to undergo ventriculo-peritoneal shunt insertion. The surgical outcome is highly dependent on the condition of the patient prior to the surgery which correlates with the location and severity of the lesion. The long-term survival of occipital encephaloceles is only about 50%. CM III is known to be accompanied by meningoencephalocele of the top of cervical vertebra and occipital region, cerebellar prolapse and hydrocephalus. In our case, the infant presented with huge meningoencephalocele associated with ACM type III, did not have any respiratory and neurological complication. Newborn infants with CM III often suffer from respiratory failure, swallowing dysfunction, hypertonia or amyotonia. Due to significant respiratory failure associated with this type, the prognosis is known to be very poor. Anaesthesia management of meningoencephalocele for surgical correction in terms of positioning of head, mask ventilation, intubation difficulty, fluid and blood loss and maintenance of normothermia have always been a challenge for anaesthesiologist but with appropriate planning it can be achieved safely and successfully. Cote Charles J, Miller Ronald D. Miller's Anaesthesia, 7th ed., Chapter: 82, Pediatric anesthesia, Churchill Livingstone; 2010. p. 2589. Suwanwela C, Suwanwela N. A morphological classification of sincipital encephalomeningoceles. Neurosurgery 1972;36:201-11. Mahapatra AK, Agrawal D. Anterior encephaloceles. A series of 103 cases over 32 years. J Clin Neurosci 2006;13:536-9. 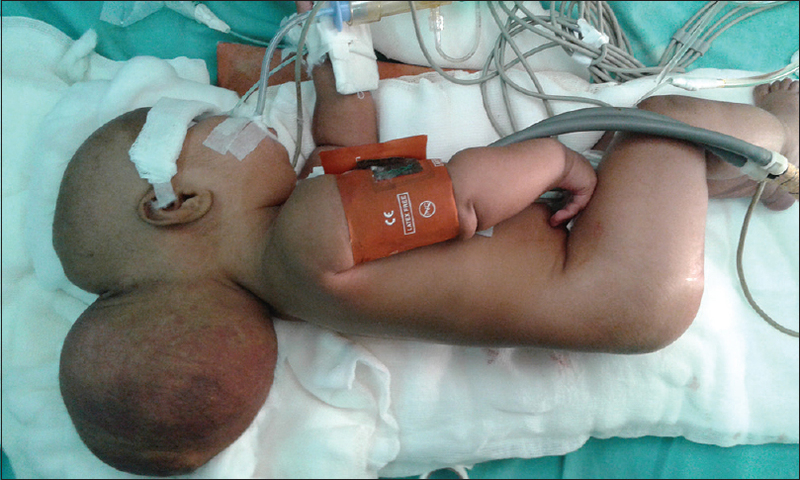 Singh N, Rao PB, Ambesh SP, Gupta D. Anaesthetic management of a giant encephalocele: Size does matter. Paed Neurosurg 2012;48:249-52. Mowafi HA, Sheikh BY, Al-Ghamdi AA. Positioning for anaesthesia induction of neonate with encephalocele. Internet J Anaesthesiol 2001;5:3. Mahapatra AK. Frontoethmoidal encephalocele. A study of 42 patients. In: Samii M, editor. Skull Base Anatomy, Radiology and Management. Basel, Switzerland: S Karger Basel; 1994. p. 220-3. Humphreys RP. Encephalocele and dermal sinuses. In: Cheek WR, Martin AE, McLone DG, Reigel D, Walker M, editors. Pediatric Neurosurgery: Surgery of the Developing Nervous System, 3rd ed. Philadelphia: Saunders; 1994. p. 96-103. French BH. Midline fusion defects and defects of formation. In: Youman JR, editor. Neurological Surgery. Philadelphia, PA: WB Sunders; 1990. p. 1164-9. Cama A, Tortori-Donati P, Piatelli GL, Fondelli MP, Andreussi L. Chiari complex in children: Neuroradiological diagnosis, neurosurgical treatment and proposal of a new classification (312 cases). Eur J Pediatr Surg 1995;5(Suppl 1):35-8. Castillo M, Quencer RM, Dominguez R. Chiari III malformation: Imaging features. AJNR Am J Neuroradiol 1992;13:107-13.